At Great Deal Furniture, we offer affordable, luxury furniture and home decor that’s designed with your comfort and style in mind. Our Chantal counter height stool set features soft saddle seats, with padded cushions for increased comfort. The warm beige linen upholstery is studded with brass nailheads, for a unique and attractive design that will accent any home. A sturdy hardwood frame, crafted of robust, black-stained wood, provides added durability and years of use. Best of all, the Chantal stools are backless, allowing them to effortlessly glide under counters, tables, kitchen islands or desks without getting stuck. Add these sophisticated counter stools to your home for a contemporary and modern aesthetic. Each chair measures at 18 inches wide, 26 inches high and 15.35 inches deep. Easy assembly with tools and instructions included. WOVEN LINEN SADDLE SEATS: Our modern counter stools feature a soft linen upholstery in a warm beige that is certain to complement any home decor. COMFORTABLE PADDED CUSHIONS: These small barstools have plush, padded cushions for added comfort. SET OF 2: When you order our Chantal stools, you’ll receive a set of 2. This lovely pair of stools is accented with brass nailheads for added elegance and sophistication. HARDWOOD FRAME: Sturdy hardwood frame construction and wooden legs make these stools especially durable and built to last for years to come. CONVENIENT HEIGHT: Great Deal Furniture’s Chantal stools are backless and slide easily under counters, desks, and tables. 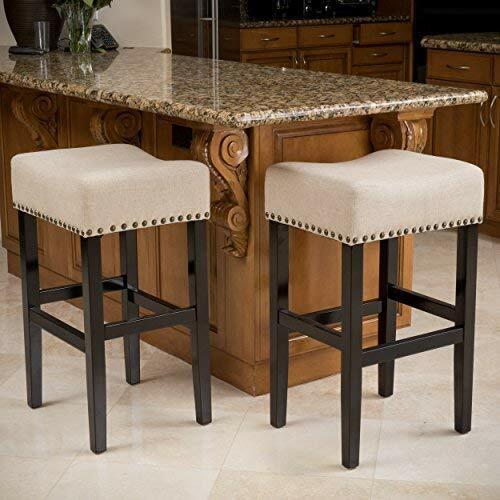 These counter height stools make a great addition to any island, or kitchen countertop with a height of 26 inches, a width of 18 inches, and a depth of 15.3 inches.